Arlington Stadium is situated just 9 miles north of Eastbourne. The track is a 350yard long concrete oval with banked corners and an armco barrier. 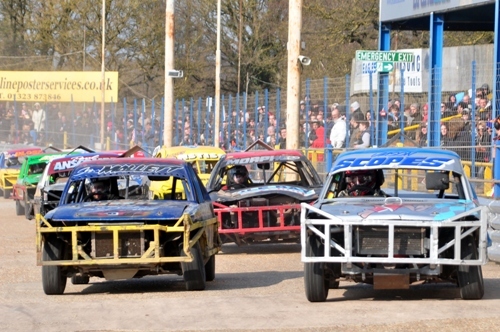 The close proximity of the catch fencing to the track fence ensures that spectators are close to the action! The facilities at the circuit are excellent. The covered grandstand is centrally heated and there is a licensed club house. Other facilities include hot dog/hamburger stalls, toilets (including disabled access) and a sponsors lounge. There is also grass banking /terracing around the bends. There is ample car parking available. The pits are situated within the trees along one side of the main stadium. Doors open around an hour before the advertised start time, which is also the time of the first race. For our more popular events on Bank Holiday Mondays and Wednesday nights we recommend that spectators arrive one or ideally two hours before start time to take advantage of the security monitored car parking facilities. Post Code for the track is BN27 3RE.